Martha Ellis Gellhorn -- a contributor to The Atlantic Monthly for more than three decades, one of the first women ever to work as a war correspondent, and a writer with an unabashedly personal voice -- passed away at her home in London on February 15, 1998, at eighty-nine years of age. Gellhorn began her career as a journalist during the Spanish Civil War, arriving in Madrid in 1937 with nothing but a knapsack, fifty dollars, and an assignment to cover the conflict for Collier's Weekly. During this period she met Ernest Hemingway, also in Spain as a correspondent; they married in 1940, he becoming her second husband and she his third wife. The marriage lasted five years, ending when Gellhorn left Hemingway, the only of his wives to do so. A gutsy reporter, Gellhorn would go to great lengths to get a story -- stowing away on a hospital ship and sneaking ashore as a stretcher bearer during the D-Day landings at Normandy, riding along with British pilots on night bombing raids over Germany, accompanying Allied troops when they liberated Dachau. And her energy reserves seemed inexhaustible: incredibly, in 1989, at the age of eighty-one, she was still out at the front reporting -- on the United States invasion of Panama. It was only when war came to Bosnia that she had to pass on taking an assignment, saying that she was too old and not "nimble" enough for war anymore. 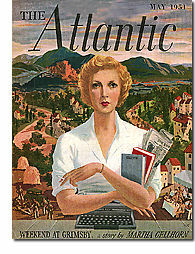 In memory of Gellhorn we're making available a few of her major contributions to The Atlantic. Although not war reporting per se, these selections show the extent to which Gellhorn was influenced by her experiences during the Second World War -- and the extent to which her style of reporting has influenced subsequent generations of journalists. Reporting on the war-crimes trial of Adolf Eichmann in "Eichmann and the Private Conscience" (February, 1962), Gellhorn grappled with questions of good and evil that the trial inevitably brought to mind. Two years later, in "Is There a New Germany?" (February, 1964), Gellhorn gauged Germany's ideological recovery from the Second World War by speaking with many German students. Her findings were harsh and unflattering. The adults of Germany, who knew Nazism and in their millions cheered and adored Hitler until he started losing, have performed a nation-wide act of amnesia; no one individually had a thing to do with the Hitlerian regime and its horrors.... The young realize this cannot be true, yet one by one, each explains how guiltless his father was; somebody else's father must have been doing the dirty work. Santayana observed that if a man forgets his past he is condemned to relive it. Germans trained in obedience and dedicated to moral whitewashing are not a new people, nor are they reliable partners for anyone else. Although Gellhorn was known best for her reporting, she was also an accomplished writer of fiction. In her lifetime she wrote five novels, fourteen novellas, and two collections of short stories, several of which were published in The Atlantic. One of these stories, "The Smell of Lilies" (August, 1956), received the O. Henry Award First Prize in 1958. The story depicts the relationship between an adulterous husband and a terminally ill wife who is ignorant of his affairs. Its style is trademark Gellhorn: painfully honest. She isn't guilty, he thought with terrible weariness, she has committed no crime, she doesn't prefer death to life. She is blind and completely unreal from these years of nothingness, but she isn't guilty. Why can't she die? Fighting to live on a chaise lounge, fighting off the need of a child. Why can't she die? Die. God, make her die. Ironically, Martha Gellhorn was better known for her brief marriage to Hemingway than for her long career as a writer. This was something she openly resented. These articles, we hope, will help demonstrate that Gellhorn was a writer and reporter deserving of serious attention in her own right, not just a woman once married to a famous man.